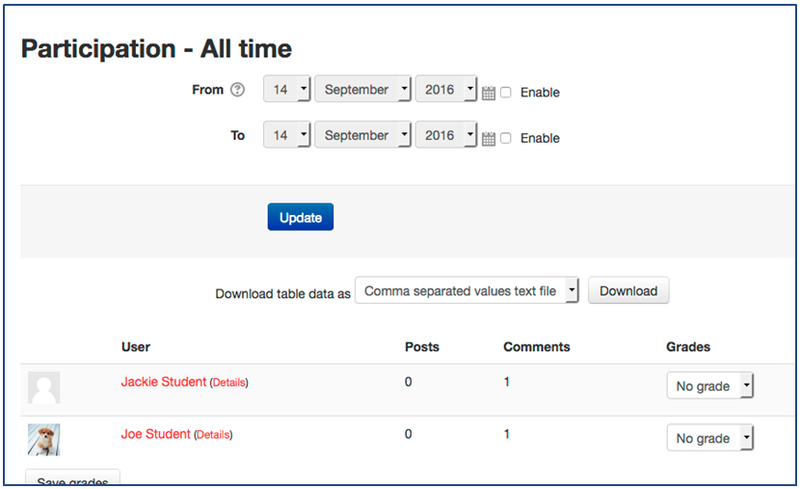 The OU blog tool can be used to create a shared blog for the whole student cohort or for groups of students. 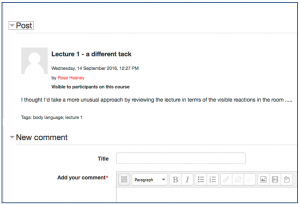 It can also be used to provide an individual blog (journal) for each student on your course. Comments can be turned on or off. 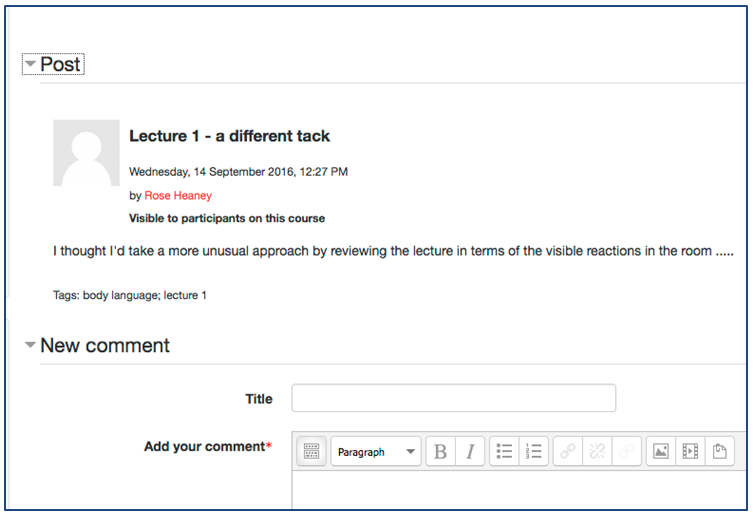 Shared blogs (as opposed to individual ones) can be made visible to all course members, all logged-in users or the public. 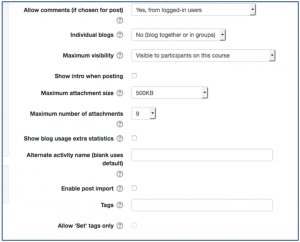 Blogs can be tagged – clicking a tag will show all posts in the current blog with that tag. 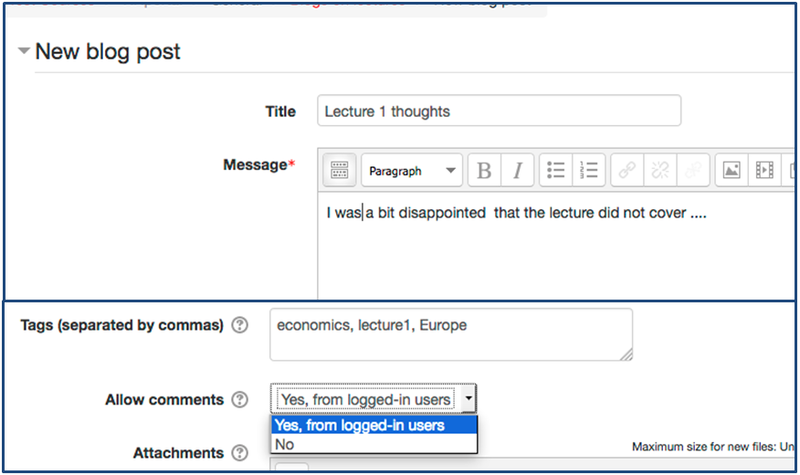 OU blog tags are not connected with Moodle tags as used in profiles etc. Turn editing on click Add an activity or resource in the section where you would like to add the blog. Scroll down, select OU Blog and click Add. a meaningful Blog name (and Intro if required). 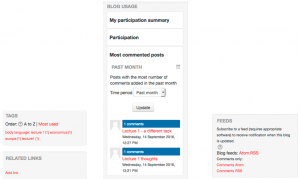 Allow comments – whether comments are allowed and by whom. 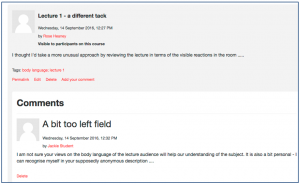 (If comments are allowed, students can still decide on whether to allow them on an individual post – see below). 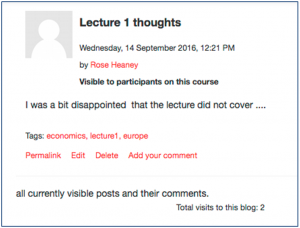 Individual blogs – is it to be a shared blog for the whole class (or groups) or for individual use? 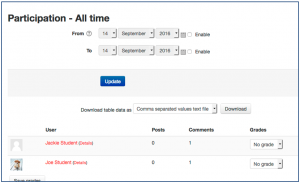 If it is to be used individually, can students see each others’ (Visible …) or will each blog be private between student and teacher (Separate …)? Maximum Visibility – is it visible to everyone on the course, all logged in users or anyone in the world? 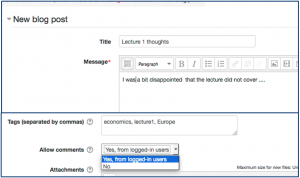 (Students can override this setting at individual post level – see below). Many of the other settings can often be left to default. Click context sensitive help to find out more about each. Use Grade if you wish to assess blog posts. This works in the same way as on other activities that allow grading e.g. Assignments, forums etc. Ratings can be used on blog posts with the ability to restrict this to certain roles e.g. teachers but not students. 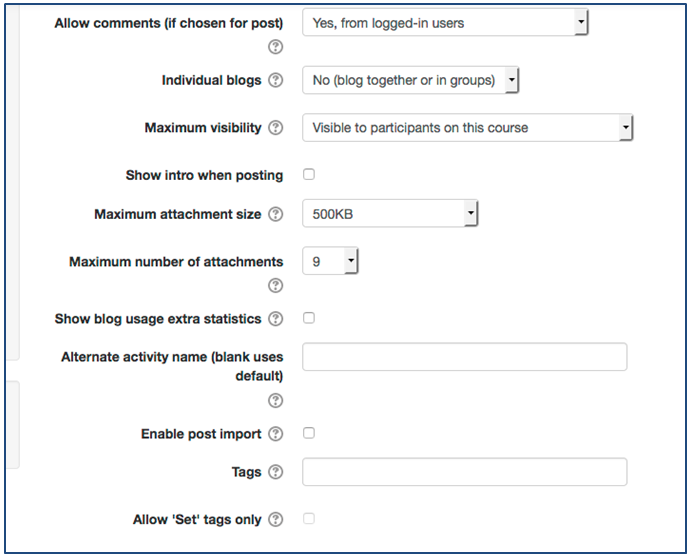 Common module settings is relevant if you are setting up a group blog. Restrict access works in the same way as with other activities. 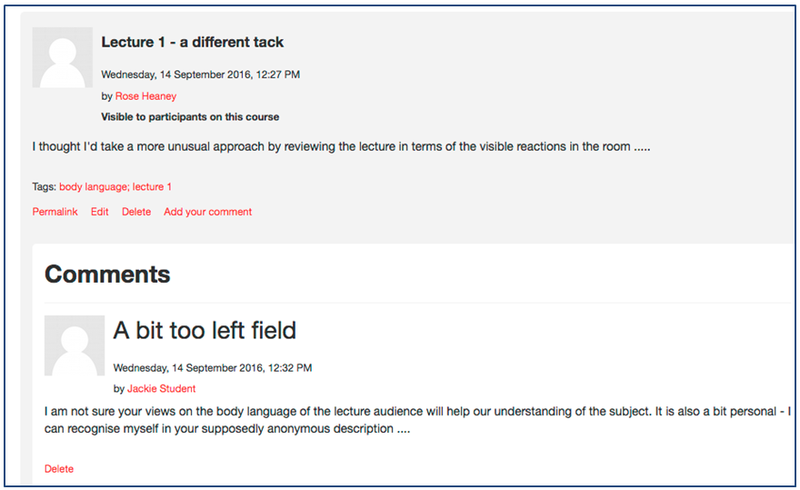 The blog appears on your course with a special icon as below. Click to use it. Click New blog post to add a post. Type a Title and then type the post in the Message Choose tags and decide whether to Allow comments or not. Attachments can also be added if required. On completion, click Add post. The post will appear as below. If you are not happy with any aspect, you can use Edit, Delete. 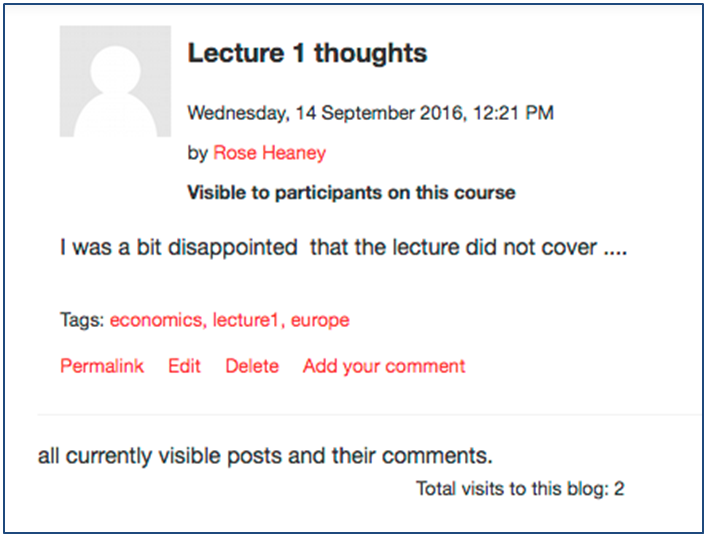 To comment on a blog post, click Add your comment. Expand Post (at the top) to see the original post as you type your comment. On completion of the comment, click Add comment. The comment will then appear with the option to Delete. 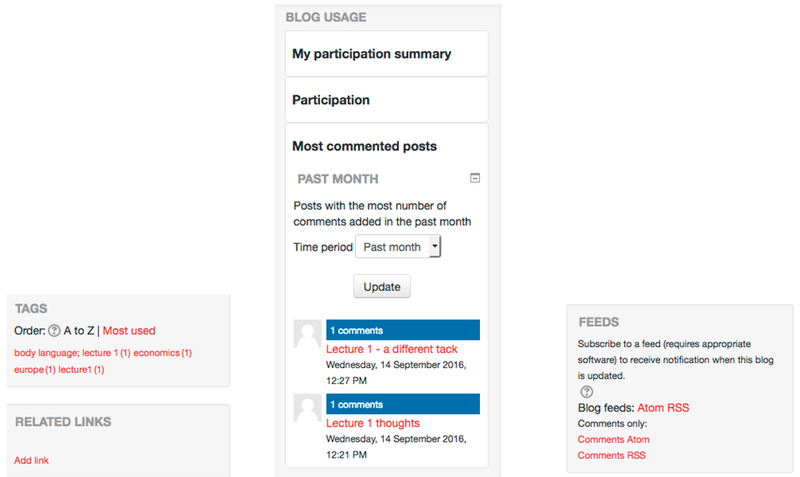 Once the blog is in use by students (and staff), use Participation by user for a summary of activity by user. You can filter this by date and apply grades if relevant. Don’t forget to check out the other features (TAGS; RELATED LINKS; BLOG USAGE; FEEDS) that appear on the right whenever you open the blog.